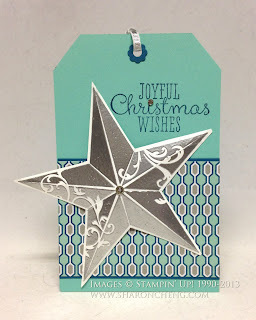 I was inspired to make this Joyful Christmas Star tag with my stamp club, after seeing Barbara Raffman's card,. I changed up her instructions slightly. Mostly because I couldn't find my stylus when I was making the sample! LOL. Instead of scoring the lines first, I folded the paper along the lines of the star. I didn't try to fold all the way to the tips. After folding all the lines, I made sure that the short lines formed valleys and the longer ones formed the mountains. While it would be helpful to score with heavier card stock, thankfully everything worked out with the Whisper White card stock. And yes, my stylus re-appeared after finishing this project! To attach the 3D star to the project, I stacked two Stampin' Dimensionals, attached them to the center back of the folded star and added to the Christmas tag. 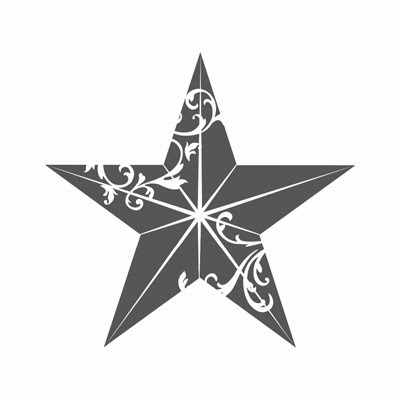 The Christmas Star is a single stamp. I stamped Whisper White card stock with Versamark ink and then heat embossed with silver stampin' emboss powder. While it's called the Christmas Star, can you see using this 3D star in patriotic themes for banners, tags and other projects? You can see these ideas and more on my Pinterest board. This tag was a bonus project for my stamp club. After making the Festive Flurry Tag Bag, I had leftover Winter Frost paper. I came up with this project to use up the scraps.